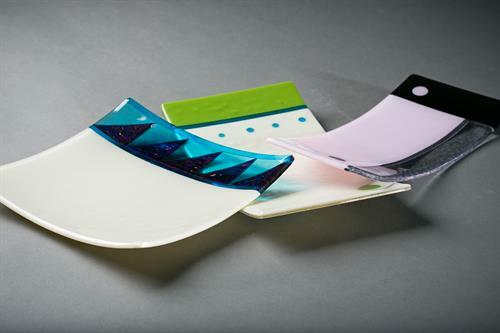 In this one day introduction to the basics of fusing, students will design and create a small rectangular glass serving dish. The class will begin with examining the elements of glass design and move on to the more technical aspects of fusing such as cutting and grinding sheet glass, glass compatibility, and fabrication of dimensional glass dishes. At the end of one day, students will have a glass pattern ready for placement into the kiln for fusing. K. Little Glass Studio on Artisans Row off of Mission Street between 5th and 6th Avenue.